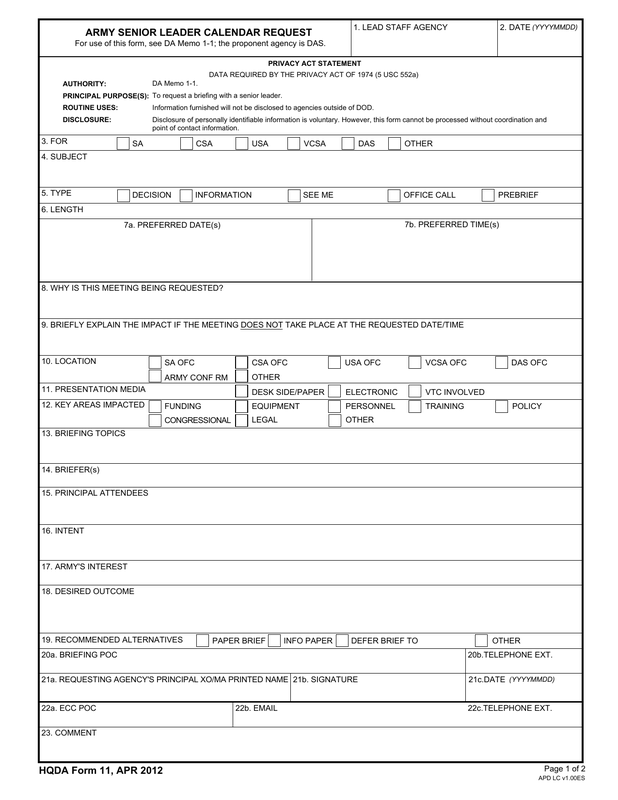 Download DA Form HQDA11, also known as Army Senior Leader Calendar Request. This form is designed to document a request for briefing with a Senior Leader. 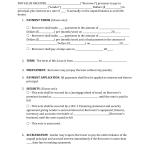 Use of the form should assist in resolving issues/actions that need immediate attention. Block 3. – Select and check the box for whom the meeting is being requested. Block 4. – Subject – Provide a clear subject for the Senior Leader’s calendar. Block 5. – Type – Check the box that best states the type of meeting will be taking place. Block 6. Provide a projected length of time the meeting should last. Block 7. – Three blocks are provided for potential meeting times and dates. 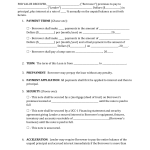 Provide at least 2 times and dates for requested meetings. Block 8. – Provide a reason why the meeting is being requested. Block 9 – Explain in brief the consequences if the meeting fails to occur prior to specific dates and why it would be best for the meeting(s) to occur on the dates provided. Block 10 – In the “Location” block place an X in the appropriate box. Block 11. – Choose and place an X in the appropriate box. Block 12. – Choose and place an X in the appropriate box. Block 13. – Provide specific information with regard to issues that will be discussed in this meeting. Block 14. – List all of the names of those who will be briefing, positions and organizations. Block 15. – List the names of the names of the Principals who will be in attendance, their positions and organizations. Block 16. – Provide an outline of the intention of the meeting. Block 17. – Explain how the subject and intent of this meeting will fit into the Army’s current situation and decisions. Block 19. – Recommend what you feel would be your best alternatives, if the meeting fails to take place, by checking the appropriate box(es). Block 20. – Provide briefing POC and Telephone Number with area code. These forms are fillable online or printable for manual use and/or sending.